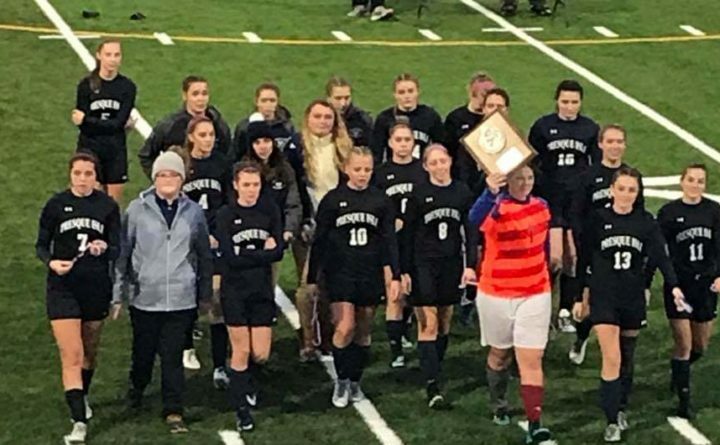 Members of the Presque Isle girls' soccer team approach their fans, with senior captain and goalkeeper Savannah Rodriguez holding the runner-up plaque, following Saturday's 2-1 overtime loss to Cape Elizabeth in the Class B state championship. HAMPDEN, Maine — The Presque Isle girls gave heavily-favored Cape Elizabeth all it wanted and more in Saturday’s Class B state championship soccer match, but junior striker Karli Chapin wasn’t going to let her Capers see their perfect season come to an end. Chapin scored the tying goal with 19:53 remaining in regulation and the game-winner with 3:46 to go in the first 15-minute overtime period as the South champions defeated the Wildcats, 2-1. The goals were the 21st and 22nd of the season for the opportunistic junior. Despite being dominated territorially and in shots attempts, Presque Isle, making its fourth appearance in the state final under 21-year head coach Ralph Michaud, gave itself a chance behind its veteran netminder on an afternoon that featured periods of heavy rain and some gusty winds. Senior Savannah Rodriguez turned in a heroic performance in the finale of her outstanding career. In the first half, she made three goal-saving plays to keep it scoreless, while adding a few more brilliant saves in the second half. The Wildcats also benefitted from some good fortune over the first 40 minutes as three of Cape’s shots caromed off the crossbar and either skipped over or were harmlessly cleared away. Rodriguez has been playing with a torn ACL, suffered during the first half of the team’s regular season opener Sept. 1. She missed seven matches before being cleared medically to return and allowed only one goal combined in the final six regular season contests and three regional playoff games. The Wildcats were outshot 19-1 before intermission, but took the lead on their first attempt of the second half. Following a Capers’ foul 40 yards away from the goal, junior Allison Himes lined a shot on target that was bobbled by Cape Elizabeth freshman goalkeeper Elise Branch. Once the ball hit the ground, PI junior Clara Kohlbacher pounced on it and ripped it into the net for her fourth goal of the post-season, which came with 31:32 remaining. It was the first time a Presque Isle team, girls or boys, had ever scored a goal in the state finals. “She has played so hard the last few games,” Michaud said. “It’s unbelievable how well she’s played in the playoffs,” Michaud said. Maggie Cochran’s cross found the head of Chapin just beyond the far post near the endline. At a difficult angle, Chapin timed her leap perfectly and redirected the ball past Rodriguez into the opposite net. “I was just trying to focus on keeping it low because others had gone over or hit the crossbar,” Chapin said. The teams played through the remainder of regulation without scoring to force overtime. Chapin provided the game-ending play by running onto a cross from the right wing by Cochran, receiving the ball on top of the 6-yard box and lightly touching the ball to the lower-left corner of the goal. “I saw it went through two defenders and I just kind of tried to redirect it,” said Chapin. Rodriguez finished with 15 saves while facing 36 shots, while Branch collected four saves on six shots for the Capers. Michaud said his game plan unfolded like he was hoping, but in the end the Capers proved too much in improving their record to 18-0 and capturing their first state title since 2013 and seventh in school history. Presque Isle (14-2-2), which was embarrassed in last year’s state final against Yarmouth, losing 9-0, made amends a year later with its gritty performance. “I’ve been waiting 364 days to get back here and they played with a purpose and I’m so proud of them,” Michaud said.